According to the UNHCR, there have been 483,597 registered refugees and asylum-seekers since February 28, 2018. From that number, 27,825 have been Ethiopians. But the global public—even Kenyan citizens—don’t seem to know much about the 10,000 Ethiopians entering Kenya. This photo project ties in both the intimacy and grief of the daily life as a refugee. Staying the night in a refugee shelter was an aspect that makes this perspective unique. There was the ability to form trusting relationships and expose the vulnerability of one family affected. On March 10th, 2018, Ethiopian citizens witnessed 13 innocent people of the Oromo tribe, get murdered by their own police. In August of 2017, Ethiopia lifted a 10-month state of emergency. since the Prime Minister, Hailemariam Desalegn, stepped down from his position in February of this year, Ethiopia has reclaimed a state of emergency. After the death of the 13 people, the melting pot of Ethiopia and Kenya’s border mixed a little more than usual. Thousands fled to Kenya to find refuge, 80% of them women and children, and 1,500 children under the age of five. Families came with nothing but the clothes on their backs, sometimes walking for 12 hours, or more, straight. Locals in Kenyan villages took the first refugees in, aiding them in any way they could. 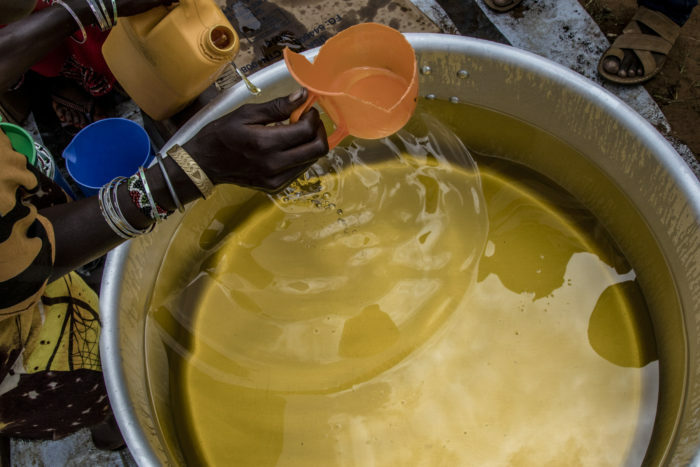 The Kenyan Red Cross, UNHCR, and UNICEF were immediately notified and took action. Providing refugees with shelters, basic food, blankets, and water. Refugees grew to 9,667, says County Secretary Malich Boru, since they first arrived. Located in one of the four refugee camps, Dambala Fachana (DF), a 50-year-old woman by the name of Darmi Molu was one of the many civilians that witnessed the massacre of her people. She told me, “It happened in the night. We were eating and then we heard gun shots. We ran for our lives.” Molu, her granddaughter, and her daughter walked across the border together. Starting at 6 a.m. and finally entering into the camp at 6 p.m. The Red Cross volunteer, Diid Jarso, told me they were among the first people to arrive. Women line up to receive their rations of food every two weeks and in order to receive it; they first need to prove they had registered in the camp. Waiting for hours in line, they circle around a volunteer in a plastic chair who checks their names. In his hands is a list of all of the registered refugees. In their hands they carry dirty UNICEF water jugs and empty bags to be filled with maze. The line of bare feet leads to their fingerprints being stamped as they go back to their shelters with food, water, and vegetable oil. 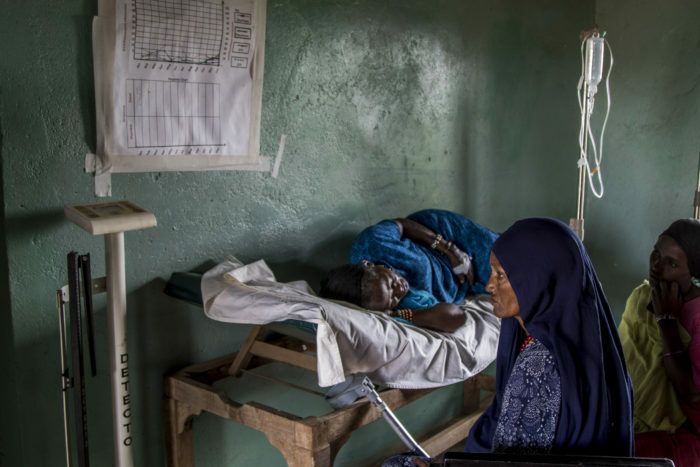 A small hospital operated by volunteers through the Red Cross, occupies a concrete building where there were two ladies on wooden beds hooked up to IV drips. They were both suffering from dehydration, the most common medical problem within the camp. In the next room over was a small girl, only one and a half years old getting a bloodied bandage removed from her left leg. Comforted by the arms of her father, she shed tears as the doctor removed the bandage and held her leg over a small metal bowl, letting the puss drain. Since this, Ethiopia has appointed a new prime minister in hopes of resurrecting peace within the country. Refugees are expected to stay in Kenya for another two months. Some are planning on staying. April 1, 2018, Dambala Fachana, Kenya. One of the most common medical problems within the camp is dehydration. A woman is hooked up to an IV drip as her relative waits for her recovery. Photo by Emma Hall. April 1, 2018, Dambala Fachana, Kenya. Vegetable is also given as rations for the refugees to cook with. Photo by Emma Hall. April 1, 2018, Dambala Fachana, Kenya. 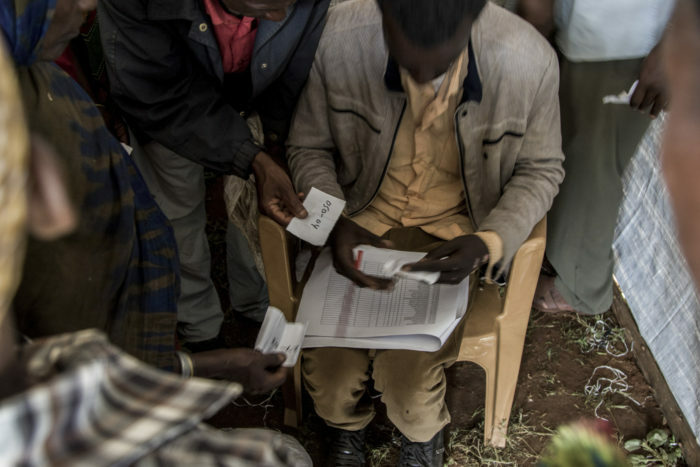 Ethiopian refugees prove their identification in order to receive rations of food. Photo by Emma Hall. April 1, 2018, Dambala Fachana, Kenya. 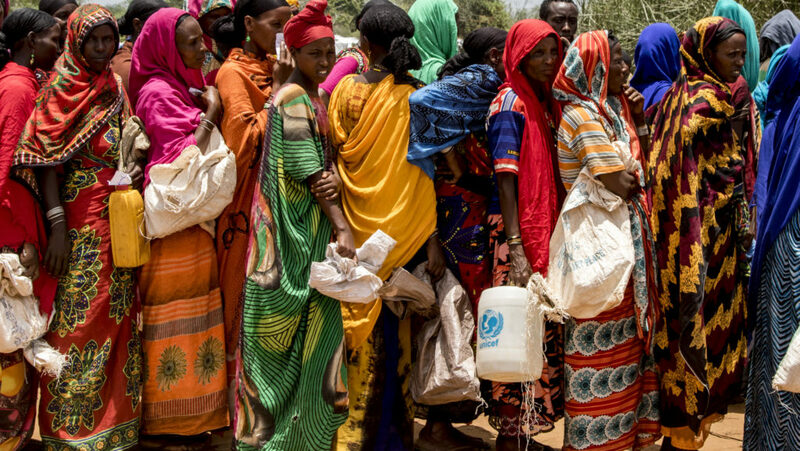 Refugee women wait in line to receive food and water rations for the next two weeks. Photo by Emma Hall.